The Asian Gypsy Moth (Lymantria dispar asiatica) defoliates many different coniferous and deciduous tree species. The Asian Gypsy Moth has been found on the west coast of the US. Surveys are conducted because of the presence of potential host material in Wyoming and because the lure for European Gypsy Moth also attracts Asian Gypsy Moth. To date, it has not been found in Wyoming. 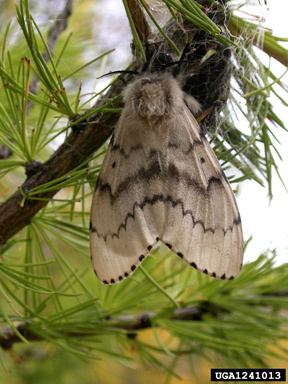 The Asian Gypsy Moth Survey in Wyoming is conducted by USDA APHIS PPQ, Wyoming State Forestry, National Park Service, US Forest Service, and the Wyoming Department of Agriculture. A sticky trap with lure attractants is placed in a potential risk area from May until October. The traps are collected and monitored for suspects at the end of the field season. If suspects are found they are sent to a USDA lab in Texas for DNA analysis. The ability to identify Asian Gypsy Moth by DNA analysis was incorporated into the gypsy moth survey program in 1992.